As much as we may enjoy Swan Lake or The Nutcracker, for many of us ballet is a foreign language. It communicates through movement, not words, and its history lies almost entirely abroad-in Russia, Italy, and France. 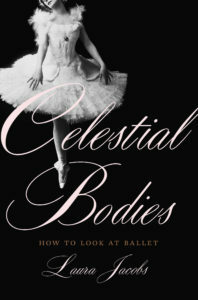 In Celestial Bodies, dance critic Laura Jacobs makes the foreign familiar, providing a lively, poetic, and uniquely accessible introduction to the world of classical dance. Combining history, interviews with dancers, technical definitions, descriptions of performances, and personal stories, Jacobs offers an intimate and passionate guide to watching ballet and understanding the central elements of choreography.